TOKYO, Japan, December 7, 2012 (ENS) – Northeastern Japan was jolted by a powerful earthquake at 5:18 pm Friday, local time. The quake produced small tsunami waves along the east coast of Honshu island. Japan’s Meteorological Agency has now lifted all tsunami warnings and advisories for the region. The quake was felt in parts of Aomori, Iwate, Miyagi, Ibaraki and Tochigi prefectures. Smaller jolts were felt in Tokyo and other areas. Emergency officials report that 10 people have been taken to hospital with injuries. No fatalities have been reported. The Meteorological Agency says today’s 7.3 magnitude quake was centered in the same area that was hit by a much stronger quake and tsunami on March 11 last year. The 2011 quake caused a meltdown of nuclear fuel at Tokyo Electric Power Company’s Fukushima Daiichi Nuclear Power Station that released radiation, forcing the evacuation of a wide area around the nuclear plant – now being decommissioned. TEPCO has another nuclear power plant in the quake-hit area that did show signs of “fluctuation,” the company said in a statement. At the Fukushima Daini Nuclear Power Station, about 11.5 km (7.1 miles) to the south, today’s earthquake shifted the foundation ground under the Unit 1 reactor building. No injury has been reported due to the earthquake at either nuclear power plant. Japan’s meteorological agency says Friday’s earthquake is thought to be an aftershock of the massive quake that hit the region in March of last year. It occurred on the east side of the Japan Trench, where two plates collide. 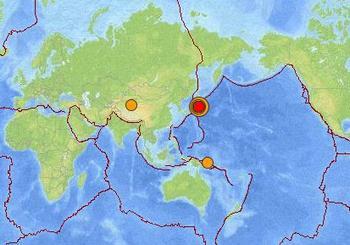 Japan and the surrounding islands straddle four major tectonic plates: Pacific plate; North America plate; Eurasia plate; and Philippine Sea plate. As it happens, today the meteorological agency scheduled testing of its new simplified tsunami warnings before the new system begins operating next March. Agency officials today began sending tsunami information in clear, simple language to state and prefectural authorities in charge of disaster preparedness. In case of very strong earthquakes, the new warning language will describe tsunami as “huge” or “high” to ensure that people evacuate quickly.